Feliks Topolski was born in Warsaw in 1907 and trained at the Warsaw Academy of Fine Arts. He arrived in England in 1935, commissioned by “Wiadomości Literackie” (“Literary News”) to record King George V’s Silver Jubilee. During the Second World War he was appointed an official war artist for the Polish government in exile, and then for the British government, commissioned to make drawings of life in London during the air raids of October 1940. He also visited the Russian Front for “Picture Post” magazine for six months from 1941-42 and made independent submissions to the War Artists' Advisory Commitee until the end of the war. Further travels took him to Egypt, Palestine, the Levant, India and Burma. 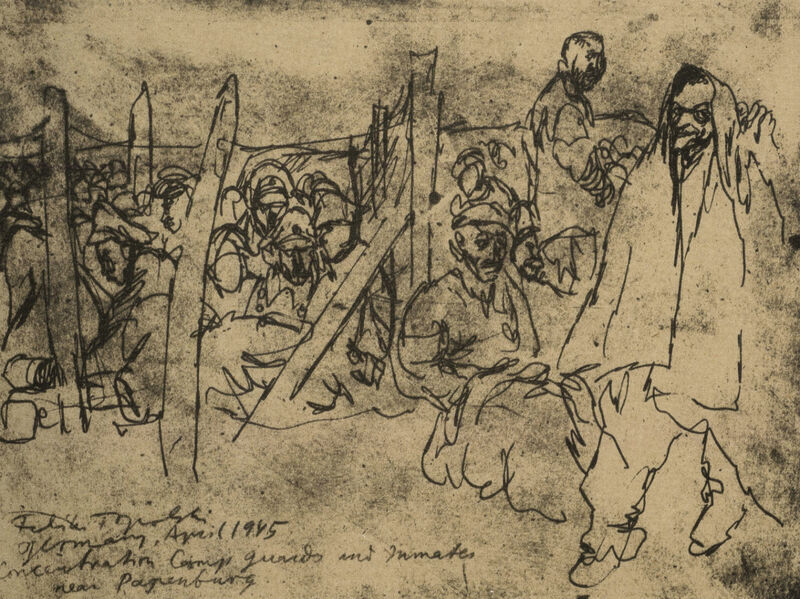 He accompanied the Polish II Corps, arriving in Bergen-Belsen concentration camp two weeks after its liberation in April 1945; his drawings of the camp featured in Ben Uri’s 1947 exhibition, “Subjects of Jewish Interest”. He subsequently worked as an official artist at the Nuremberg Trials. Topolski was also known for his portraits of writers including H. G. Wells, Graham Greene, John Mortimer and Evelyn Waugh, and politicians Harold Macmillan and Aneurin Bevan. He also painted murals, contributed to BBC programmes, and designed theatrical sets. He was elected a senior Royal Academician as a draughtsman in 1989. During the Second World War Topolski was appointed an official war artist for the Polish government in exile, and then for the British government, also travelling to Russia for “Picture Post” magazine. He accompanied the Polish II Corps, arriving in Bergen-Belsen concentration camp two weeks after its liberation in April 1945; his drawings of the camp featured in Ben Uri’s 1947 exhibition, “Subjects of Jewish Interest”. He subsequently worked as an official artist at the Nuremberg Trials.